Designed as a 28-seater, 60ft long, with a wingspan of 82 ft, and powered by two Dart RDa6 Mk 510 turboprops, each of 1780 hp. Nobody knows why it was called the Accountant - but the Accountant paid for it out of Air Charter’s cash flow. The Accountant design was partly based on the use of a segmented tensioned skin production method. The problem with the tension skin was that, in order to keep the metal evenly stressed, the curves of the fuselage had to come to a long, pointed end, which strictly limited the freight capacity of the aircraft. By the time it was built, the Accountant’s rear end was largely taken up with struts to support a large separate tail-section, while the upper half of the flight deck was stuck on the front. First flown on 9 July 1957, the press was invited in July 1957 to first flight of the prototype, which The Aeroplane described as a “plump silver partridge”. The plane performed well enough, but Laker had already decided against the tension-skin construction, and plans were drawn for a conventional fuselage. Unhappily, he could find no-one to go into partnership with him to build it. 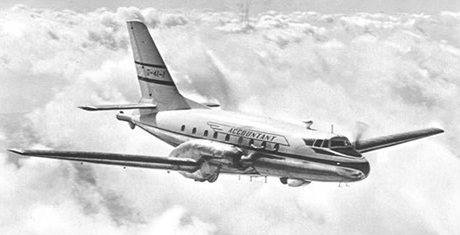 The Accountant was flown at the 1957 Farnborough Air Show, but there were already two rivals in the air: the Handley Page Herald, and the Fokker Friendship. The programmes was cancelled in January 1958, by which time the prototype had completed over 200 hrs. The engines and equipment were removed and the aircraft left in open storage. Its optimum cruising altitude, powered by two Rolls-Royce Dart 510 (R.Da.6) turboprops, would have been 30,000 ft. With S.B.A.C. reserves the Accountant would have carried a passenger pay-load of 8,363 lb for 400 nautical miles, or 6,135 lb. for 1,000 n.m. and 2,422 lb. for 2,000 n.m. At a mean weight of 20,000 lb. in I.S.A. conditions the Accountant's top cruising speed (13,600 r.p.m.) was expected to be 250 knots (290 m.p.h.). It was scrapped in 1959. Engines: 2 x Dart RDa6 Mk 510 turboprops, 1780 hp.